These colorful tofu and veggie kebobs will delight eaters of all ages. Serve for an appetizer or as a main dish with corn on the cob and salad. Put all the ingredients for the marinade into a blender and blend until smooth. Taste and adjust the seasonings, if desired. Put the tofu, vegetables and mushrooms in a large bowl. Pour the marinade over them and mix gently to coat. Let it marinate for about an hour on the counter or in the refrigerator overnight. Soak the wooden skewers in water for about 20-30 minutes if grilling over a hot fire. Skip this step if broiling. Thread the tofu and vegetables onto skewers, reserving the marinade. Broil or grill for 10 minutes; turning once and basting with the reserved marinade. Broil or grill for another 10 minutes, or until veggies are slightly crisp and the tofu is slightly brown on all sides. *Place the tofu between 2 cutting boards, plates or cookie sheets with a weight on top, like a half gallon jar of beans. (If possible, balanced and half hanging over the sink.) Let set for 15-30 minutes. This will allow a fair amount of water to drain from the tofu. Take off the jar of beans and the top cutting board and cut up the tofu into 1 inch cubes. 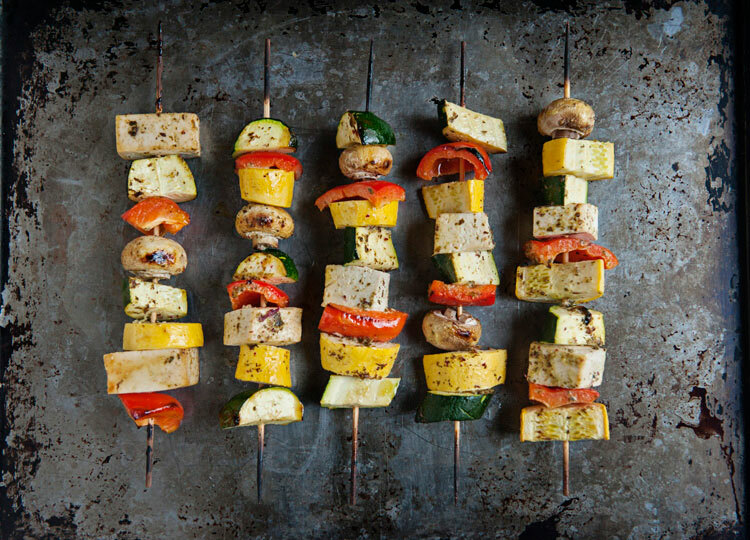 Leslie Cerier developed Maple Glazed Vegetable Kebobs with Tofu recipe for Coombs Family Farms Copyright © 2017 Leslie Cerier. All Rights Reserved to Leslie Cerier.